Advocates working to end youth homelessness have known for a long time that there are many more youth experiencing homelessness on their own than get reported in national databases. Today, Chapin Hall at the University of Chicago released a groundbreaking report that provided hard evidence to back this up. 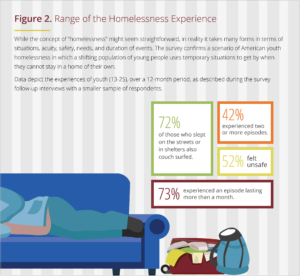 In their report, Missed Opportunities: Youth Homelessness in America, researchers found that each year over four million young people in the U.S. experience homelessness on their own. This breaks down to 1 in 30 youth (ages 13-17) and 1 in 10 young adults (ages 18-25). These youth and young adults are living in extremely precarious and often invisible situations. 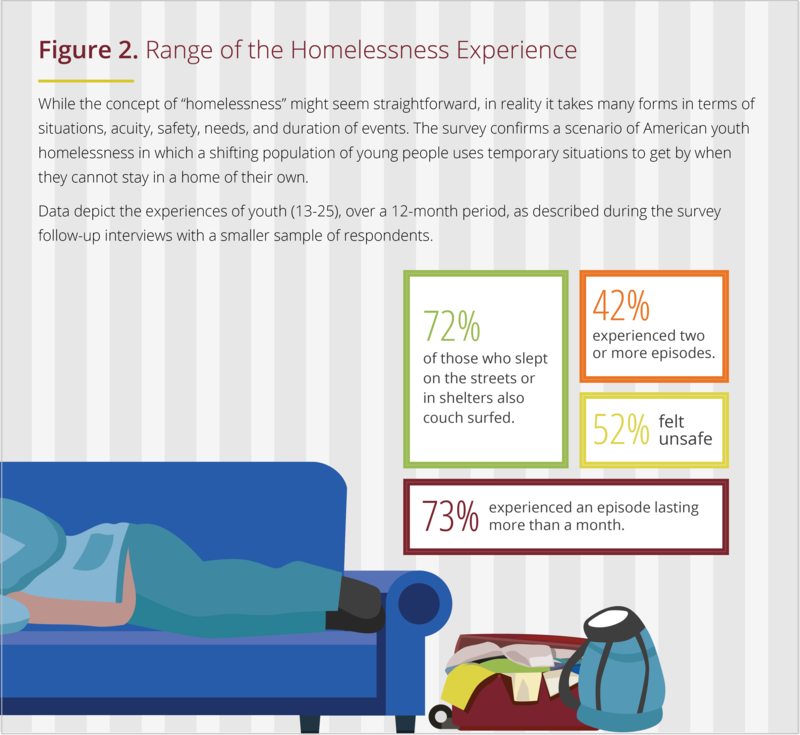 Two-thirds of the youth reported couch-surfing or other less visible forms of homelessness at some point. This was particularly true in rural communities, where the rate of youth homelessness was just as high as in urban and suburban communities. These less visible forms of homelessness mean that youth are often invisible to public systems, putting them at high risk of harm, abuse and neglect, including trafficking. According to the National Human Trafficking Hotline, runaway/homeless and unstable housing statuses are among the top five risk factors for human trafficking. These numbers are devastating and these youth and young adults deserve an immediate, robust, and cross-sector response. Solutions must include changing the paradigm of federal homeless assistance in the U.S. as well as building on the programs that are working through increased investment and resources. This bipartisan legislation would increase the visibility of homeless youth and allow communities to use federal homeless assistance funds to serve them. Currently, the U.S. Department of Housing and Urban Development (HUD) uses a narrow definition of homelessness that doesn’t include couch-surfing and other less visible situations, so many homeless youth and young adults are excluded from receiving critical homeless assistance services. The Homeless Children & Youth Act would restore local decision-making so that communities can identify less visible homeless youth and work with other systems to connect youth with developmentally appropriate services. Runaway and Homeless Youth Act programs provide vital services to homeless and runaway youth such as emergency housing with crisis intervention, basic life necessities, family interventions and when necessary, longer-term housing options including maternity group homes. Yet these programs are long overdue for reauthorization. The Runaway and Homeless Youth and Trafficking Prevention Act will soon be reintroduced in Congress and will not only reauthorize these programs, but improve their effectiveness in stabilizing homeless youth across the country, whether they are in urban, suburban or rural communities. We know that higher education is a critical gateway to help these youth & young adults find stability and escape homelessness. Yet too many homeless and foster youth face barriers to higher education and if they are able to attend a college or university, they often face hardships that make it extremely difficult to complete their studies and graduate. Legislation such as the Higher Education Access and Success Act for Homeless and Foster Youth Act (S. 1795/H.R. 3740) and the Fostering Success in Higher Education Act (S. 1792/H.R. 3742) would help homeless and foster youth access higher education through removing barriers to financial aid, as well as increase support on campuses through housing assistance and resources to connect students to services. For many youth and young adults who become homeless on their own, they had first experienced homelessness or housing instability with their family. Nearly a third of youth also had come into contact with the child welfare system and nearly half had been in juvenile detention, jail or prison. This means that in order to break the cycle of youth and young adult homelessness, we need investments in programs and resources that strengthen families and prevent incidents of homelessness, child welfare involvement and interactions with the criminal justice system. We must build on what works, and double-down on programs that provide cash assistance, mental health and trauma-informed care, substance abuse treatment, job training, rental assistance, affordable child care and pre-k, nutrition assistance and more.